Lowicryls are low viscosity, highly cross-linked acrylate and methacrylate based embedding media. They are designed to preserve molecular structure/antigens by being applied at low temperatures. Because they preserve antigenicity, Lowicryls are a useful alternative to epoxy resins in immunochemistry. 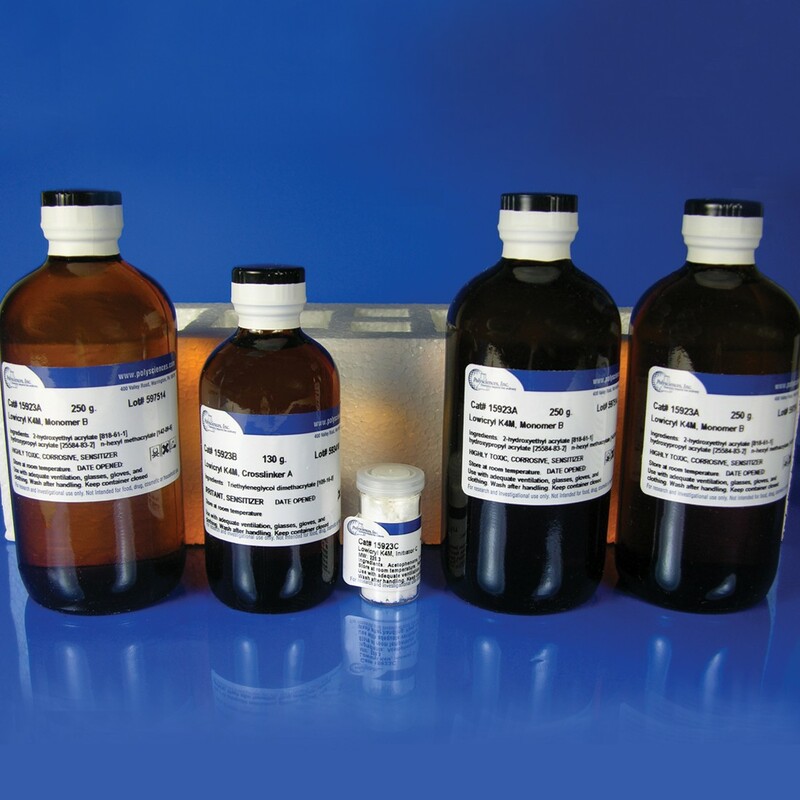 Lowicryl® K kits are polar and hydrophilic and have many advantages over other methods. During dehydration and infiltration specimens may be kept partially hydrated and polymerized with up to 5% water. They are also useful in immunolabeling of sections using specific antisera, lectins and colloidal gold particles. Lowicryl® K4M kit can be used for tissue infiltration and polymerization at temperature as low as −35ºC. The use of K4M results in better structural/antigen preservation and lower background labeling compared to other methods. Dittmann C, Han HM, Grabenbauer M, Laue M. (2015). Dormant Bacillus spores protect their DNA in crystalline nucleoids against environmental stress. J Struct Biol. 191(2):156-64. Roth J, Taatjes DJ, Tokuyasu KT. (1990). Contrasting of Lowicryl K4M thin sections. Histochemistry 95(2):123–136. Altman LG, Schneider BG, Papermaster DS. (1984). Rapid embedding of tissues in Lowicryl K4M for immunoelectron microscopy. J Histochem Cytochem. 32(11):1217-23.